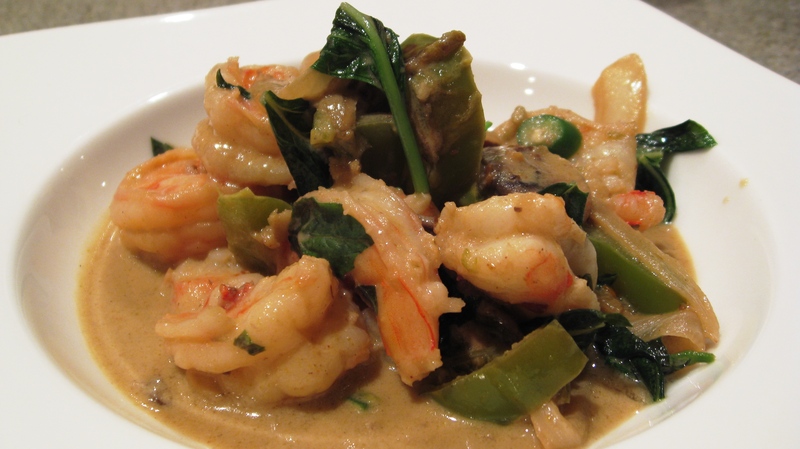 This time I’d like to share a personal favorite of mine, Green Thai Curry with big juicy prawns. It is a quick dish that is delicious always satisfying. Pair it with some delicious Cauliflower rice and enjoy it. I loved mine by itself last night. Please let me know what you think of it, once you make it. Use a non-stick wok if you have one, otherwise a big pan will do too. Roast onion in coconut oil until slightly glossy, add all peppers and saute for about 5 minutes on high heat and add mushrooms, continue to cook for another 5 minutes. Add Thai spice blend and sea salt and make sure to stir it a few times, reduce to medium heat, then add coconut milk (whisk curry paste into coconut milk prior to stirring into vegetables, to ensure that it will not be lumpy). Add prawns or shrimp and cook for 3 more minutes on medium, stir in basil and turn off heat. Serve right away by itself as my dish above or with some fabulous fresh Cauliflower rice. This recipe feeds 2 hungry Primals or 3 with a side dish. Wow! This looks delicious and healthy. Doublechecking–you use BOTH the anaheim peppers AND the serrano peppers? Oh yes! 🙂 the coconut milk reduced the heat from the spice quite a bit.